I hope everyone had a safe and happy holiday this past week. After putting in serious hours at work, I was lucky enough to have the Eve, Day, and day after off to enjoy all the festivities. My family decided to stay home (in our new home) and let the relatives come to us. The Eve was spent with my wife’s side of the family, couldn’t get out of it. We had the Day at the new house: my family for brunch, 2 hour break, her family for dinner. The day after was spent cleaning up, building toys, and sitting with stragglers that didn’t make it the day before. All in all, a good holiday. A bit of bad news though. I have been battling ear infections over the last month. I just finished my second Rx of antibiotics and, three days later on the 27th, I could feel the blockage again. A trip to my physician confirmed that I still have the infections. On a 10-scale, my Dr. gave an 8. Not good. Aside from work, I have been taking it easy: no loud music and a ton of rest. Until I see a specialist to get this taken care of, I’m a little paranoid about listening to Music. I can’t hear much out of my right ear because of the infections but I can be fixed so there is hope that the Metal will flow soon! I’ve done quite a bit of reading lately (I’ll post that soon) and I have listened to a couple of albums here and there (but at low volume). I have acquired some hard to find CDs recently that I have been on the hunt a long time for. I will start to post regularly again this weekend. My 1 year anniversary for this blog is January 3rd so I will definitely be reflecting on that. 2006 is almost over and it is safe to say that, if you are a fan of AOR, Hard Rock, and Heavy Metal, then you had a fine year full of great releases. Every year seems to bring more new releases and reissues competing for the collector’s hard earned dollar. This year I spent most of my money on catalog releases and reissues…..trying to fill some of those holes in the collection. I kept up on many new studio albums but there were so many that I had to be a smart shopper and buy the ones I absolutely had to have. It’s never an exact science but I got some great albums this year at very good prices. Honorable Mentions: Krokus – Hellraiser, MSG – Tales Of Rock’n Roll, Lacuna Coil – Karmacode, Axel Rudi Pell – Mystica, Warrant – Born Again, and Toto – Falling In Between (who would have slid into #5). The surprise of the year! I bought this solely because of Graham Bonnet’s (ex-Rainbow, MSG, Alcatrazz) involvement on vocals but I got a fine Hard Rock album full of hooks and melody. Can’t go wrong there! Well written songs and good musicianship = a good album. This exceeded my expectations and, as a KISS diehard, they were very high. I wasn’t looking for a new KISS album, I was looking for a good Hard Rock album (something KISS has forgotten about). A bit modern and Pop flavored but Paul writes good songs and his voice sounds in fine form. If it wasn’t for the next two bands releasing new albums in 2006, Motorhead would have taken the top spot. How many excellent albums does Lemmy and co. have to make before people outside the Metal community take notice? Basic “in your face” Heavy Metal that picks you up and smacks you across the head. Motorhead continues to churn out good albums year after year. Another member of the “old guard” that just makes good Hard Rock albums. The Monkey Puzzle is an album of superb quality of blues-based Hard Rock full of melody, hooks, and solos. Songwriting is top notch and the performances are dead on for a band pushing 35+ years on the scene. This release flirted with the top spot for most of the year and would have been the top album if it wasn’t for the next release. When Iron Maiden releases a new album, it is almost a given that it will be a classic release and one of the best of the year. Since reforming with Dickinson and Smith, Maiden had put out two excellent albums but A MATTER OF LIFE AND DEATH really stands out. The songs are longer, more progressive, but they are high quality. Seasoned veterans like this write great albums and this is a great album. I haven’t enjoyed a Maiden album this much since POWERSLAVE (1984). The most consistent lineup in the since the Ozzy and Dio days reforms again to create FORBIDDEN. The same band that toured for HEADLESS CROSS and created TYR are shadow of their former glories, hindered by management and producer alike. The ultimate question is: Who’s idea was it to bring in people from the Rap community to guest star and produce the album? Tony Iommi is in total control, Cozy Powell reduced to a less active role in band affairs. FORBIDDEN is the last studio album on contract to I.R.S. Band management wants to capitalize on “current” trends in the Metal community (Rap-Rock) so they bring in Body Count members Ice-T and Ernie C. (producer). The seeds of a reunion with Ozzy Osbourne and the original Sabbath are in the planning stages. Black Sabbath, the founding fathers of Heavy Metal, aligned with Rap? Say it ain’t so! Opening song ‘The Illusion Of Power’ has a mid-song rap by Ice-T. The song sounds weak: Martin’s vocals are stripped down, no backing vocals and the formidable rhythm section is put to the background. What you initially hear is a precursor to the rest of the album. Every song on the album sounds like a demo, almost like a bad bootleg. The production is just horrible compared to previous efforts. Obviously, Ernie C. does not know how to produce a Heavy Metal record with world class musicians. All this guy had to do was add some ideas and steer the proceedings, not ruin them. He was handed some of the best musicians of their craft and he relegated them to annoying background noise. I’ve read that Ernie C. was looking for “a more organic, more stripped down feel”. There is a difference between a back to basics approach and a dismantling of a band’s sound. As with the opener, the rest of the album is subject to a distant, “tinny” drum sound, not Cozy’s hard-hitting style. Same with the bass, Neil Murray being a top notch bass player but relegated to being pushed way back in the mix. After four studio albums where the vocals are superb, Tony Martin is put in a bad light due to the lack of background. Does Martin need background vocals to get by, to mask an inability? No, the actual song needs the backing tracks to bring that lush Sabbath sound found on the previous albums. Every song has some very good guitar by Mr. Iommi, there are some very good basic ideas, but they sound unfinished. An awful album. This is not true Black Sabbath, this is a butchering of a legendary band. The blame lies at the feet of Tony Iommi. He had final say in everything, it’s his band. Obviously a rush job of an album to get out of the current contract and move to more lucrative ($$$) pastures with Ozzy and Sharon. I never reach for this album. For this review, I actually had to listen for a couple of weeks to get familiar with it again. Thankfully I don’t have to reach for it anytime soon. 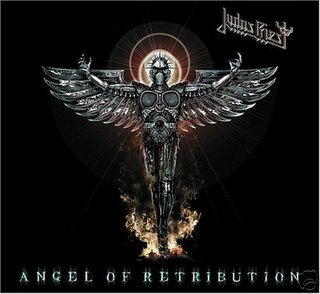 Favorite songs: ‘Get A Grip’, ‘Rusty Angels’, and ‘Forbidden’. If there was ever an album that ever needed a remaster to fix the production, it’s this one. 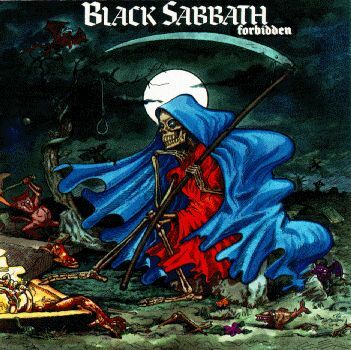 Many Sabbath fans point to 1983’s BORN AGAIN (with Ian Gillan on vocals) as the most poorly produced Black Sabbath album due to it’s “muddy” mix. Those fans can now turn to FORBIDDEN for that title. UPDATE 6/13/07 – Jeff Scott Soto out of Journey! December 19, 2006 — Jeff Scott Soto has been officially named the new lead singer of Journey. He had been filling in for Steve Augeri, who had to leave the U.S. tour with Def Leppard shortly after it began on June 23 due to illness. After witnessing the Soto-led Journey in concert this past Summer, I can personally say that this was a move in the right direction. Jeff Scott Soto has been one of the most acclaimed singers in the industry but a virtual unknown to the public. Fronting Journey will no doubt boost interest into his previous work (solo, Talisman, Humanimal, etc.) while raising the bar for the band. Former Journey frontman, Steve Augeri, had to battle the constant comparisons to Steve Perry as they sound similar. JSS brings his own style and energy to the Journey camp. Great move by Journey to retain JSS, an obvious move but still great. Now doesn’t that get you in the holiday spirit? Concrete Jungle – Wear and Tear (1988) CD ends at $250. I’ve seen this go upwards of $500 over the years so this is a “bargain”. The buyer was smart and ended the auction early with BUY IT NOW before a bidding war ensued. Tindrum – Drums Of War (1988) original pressing CD goes for $249.95. Well, it’s 5 cents cheaper than the Concrete Jungle CD. The seller, surrf, is a major player in the CD collector’s market so I believe it’s an original press and not one of the many bootlegs that have surfaced this year. The fact that there were two separate copies up on auction says all you need to know about surrf’s collecting abilities and how rare this CD is. Motley Crue’s 1st five albums still sealed in longboxes reaches $204.49. I have seen each one of these albums, still sealed in longboxes with minimal damage, on many a CD hunt. I believe the prices ranged from $8 to $15. Imagine if you bought all 5 at $15 each, your $75 investment almost triples! People will buy anything so I am going to start buying these up as I find them! Angel Dust – Into The Dark Past (1986) original pressing CD ends at $256.51. This is our big winner today, edging out Concrete Jungle for this installment. Angel Dust’s debut is hard to find in the original 1986 pressing, there are plenty of reissue bootlegs out there. In fact, one “reissue” is up now for $11 BUY IT NOW. The easier way would be to grab a vinyl copy that go between $25-$40. A lot for vinyl but better than pricey CD. New Saxon album and DVD due in 2007. SPV/Steamhammer will release NWOBHM legends SAXON’s new studio album, THE INNER SANCTUM, on March 5th, 2007. Available on the same date will be Saxon’s new double live DVD, entitled TO HELL AND BACK AGAIN. More details on both releases to follow. Looks like March 5, 2007 is going to be a great day already! Saxon has made some truly great albums since 1997’s UNLEASH THE BEAST and their CHRONICLES DVD (2000) is superb. If they continue down the same path they have for the last 10 years, no one will be disappointed. Marc Storace and company give another kick at the cat with the new offering – HELLRAISER. I thought that 2003’s ROCK THE BLOCK was one solid comeback album for Marc Storace and (then) lead guitarist Fernando Von Arb. Their brand of boogie woogie Hard Rock, comparisons to AC/DC abound, still held up after years of personnel changes and lackluster material since 1990. Krokus was enjoying their first successful U.S. released album and tour in 15 years but Fernando Von Arb abruptly retired and former Krokus guitarist Mandy Meyer filled the vacancy. Add former Accept drummer, Stefan Schwarzmann, and the foundation of the new Krokus is solidly built. HELLRAISER is an album that, at first listen, seems very long. Clocking in just under an hour doesn’t seem too long but, when there is some average filler mixed in with more than a few solid tracks, the listener gets that “Haven’t I heard this before?” vibe. Once you’ve given the album a few spins, you realize that this is just the way Krokus does business: it’s pure ’80s party Rock. Yes, it sounds like AC/DC and Accept mixed together. Yes, it sounds dated. 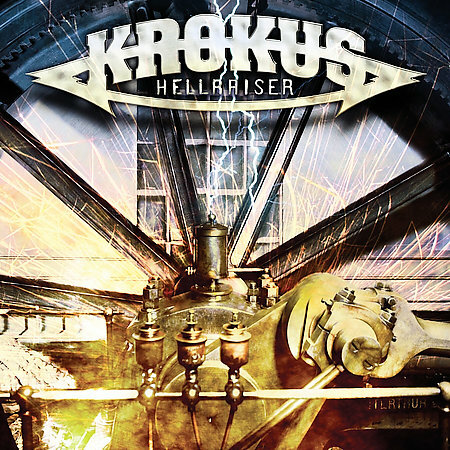 This is what makes Krokus who they are, never straying from the style they’ve always had. The opening track, ‘Hellraiser’, sets an immeadiate Hard Rock party feel. It sounds like ’80s Krokus circa HARDWARE (1981) or ONE VICE AT A TIME (1982). ‘Too Wired To Sleep’ and ‘Hangman’ continue the good times with plenty of solos, hooks, and melodies. If you’re not singing along by now, you don’t get it. ‘Angel Of My Dreams’ is a decent ballad but ‘So Long’ is much better. You can feel the song much like you could feel 1983’s classic ‘Screaming In The Night’. ‘Spirit Of The Night’ has to be the fastest Krokus song I’ve heard in years. Very much like Accept and/or U.D.O., probably due to Schwarzmann’s contributions, ‘Spirit Of The Night’ boasts some powerful drumming and lightning guitar. Other highlights on this platter include: ‘Fight On’ and ‘Midnite Fantasy’. All the songs past this are basically interchangeable, maybe if two or three were cut you’d have a more cohesive album. When your first eight songs are outstanding, it’s hard to call the album a dud. Any band recording this type of music today would kill to have three or four solid tracks in a row let alone eight. On those eight songs alone, I can say that HELLRAISER is truly a fine album. It’s not that the last six songs are bad, I just think that you could cut any three and the album would be better for it. Like I mentioned before, sometimes a few “fillers” can spoil the cohesiveness of what is a really good Rock album. Favorite tracks: ‘Hellraiser’, ‘Too Wired To Sleep’, ‘So Long’, and ‘Spirit Of The Night’. This video for ‘The Hand That Rocks The Cradle’ is the only video produced for the CROSS PURPOSES album. Notice that it actually got played on MTV during Headbanger’s Ball. MTV wasn’t known for airing many Sabbath videos. 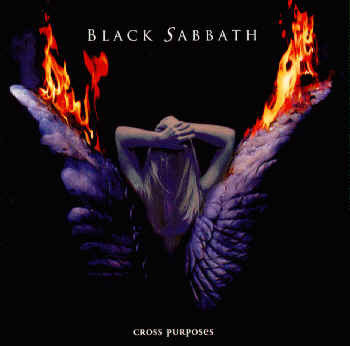 Four years after the TYR album, the Tony Martin-era continues in Black Sabbath with CROSS PURPOSES. In between both albums, the Ronnie James Dio-era Sabbath reunited for an album called DEHUMANIZER (1992). The subsequent tour proved successful but personal conflicts and some gigs with Ozzy Osbourne in Costa Mesa, CA imploded the band. Enter Tony Martin again. The first three opening songs are excellent. ‘I Witness’ starts it off with a powerful punch and ‘Crown Of Thorns’ slows it right down. ‘Cross Of Thorns’ has some excellent acoustic guitar from Tony Iommi. It’s a mid-tempo song but the acoustics and keyboards give the song a haunting feel until the tradmark Iommi riffs kick in come chorus time. ‘Psychophobia’ kicks the album into high gear again with a monster guitar riff and some excellent drums from Bobby Rondinelli. The next five songs leave me a little cold. Mostly slow to mid-tempo tracks, it sounds like songs we’ve heard before on previous albums. The last two, ‘Back To Eden’ and ‘The Hand That Rocks The Cradle’ are the best of the bunch. The album gets faster again with my personal favorite, ‘Cardinal Sin’, and then with ‘Evil Eye’. Both are great tracks that highlight Sabbath’s strongpoints: faster songs with guitar mastery and good vocals. I have the Japanese version rather than the U.S. so I get the bonus track: ‘What’s The Use’. The question should really be: “Why keep this as a bonus track?”. This song is uptempo with blistering riffs and a great solo. Obviously, those who bought the U.S. issue of CROSS PURPOSES missed out on a highlight track. The first and last three songs are superb, the middle sounds like filler. It’s not that songs 4 thru 8 are bad, they just sound the same, like it’s all been done before. Maybe the album would benefit from a different track order and a couple of faster paced songs replacing a couple of mid-tempos. I also would have included ‘What’s The Use’ as part of the album proper and used a slower song for the Japanese bonus track. Martin provides a good vocal performance and Iommi is still ruler of Heavy Metal guitar, as innovative as ever with his parts on the album. The drum sound is a little weaker compared to Cozy Powell’s on HEADLESS CROSS and TYR but Bobby Rondinelli does a decent job. CROSS PURPOSES comes in a little short when compared to the first three Tony Martin-era albums. A good album, not a great album. If we rated on a 10-scale…..I’d say a 7. Anytime an album featuring Graham Bonnet is released, I have to buy it. One of my favorite Hard Rock singers of all time, I can’t find an album where Bonnet doesn’t shine at the mic. But who is Taz Taylor? I had no idea. A quick search and I found an excellent musician from Birmingham, England that plays guitar along the lines of Michael Schenker. If you close your eyes come solo time, it’s very close to the master while holding on to his own style. You can hear the influences right away: Schenker, UFO, Gary Moore, Ritchie Blackmore, Van Halen…..not a bad combination to draw from and form a personal flavor. You hear it right away, this is a guitar album, plain and simple. WECOME TO AMERICA! offers an album laden with melodic hooks and superb guitar. Right from the start ‘Fighter’s Fist’ and ‘Radio Luxembourg’ (my favorite song on this album) get you singing along, tapping your feet, and doing your best air guitar. Close your eyes during the Gary Moore instrumental ‘Parisienne Walkways’…..it’s slow, it sounds sad, you can feel the emotion. It feels as if you were walking alone down the street after a long night and this is the soundtrack. There’s full on Hard Rock with ‘Happy Hour’, ‘Wall Of Sound’, and the title track. A couple of “softer” ballads in ‘Haunted’ and ‘Silent Fall’. ‘Silent Fall’ is especially striking in the calm opening intro of guitar and piano, swiftly building to a blazing guitar solo, before finding a mid-tempo groove. I find the last two tracks intriguing: ‘The Reprise’ an upbeat instrumental that reminds gives off a UFO/MSG vibe. ‘Goodbye Mr. C’ is an interesting cover of Ozzy Osbourne’s ‘Goodbye To Romance’ and ‘Mr. Crowley’ taking half of each song. The first half (Goodbye) is superbly done on acoustic guitar while Graham lends a wonderful vocal. Second half (Mr. C) kicks in and provides the punch. To someone unfamiliar with the Ozzy versions, they would think it’s the same song. Very well done. Melodic Hard Rock with enough hooks and solos to make this one of the best albums of the year. The songs are well written, full of melody. Nothing overdone, nothing too excessive. The band provides excellent music while Bonnet (almost 60 yrs old) provides great vocals that singers half his age cannot master. 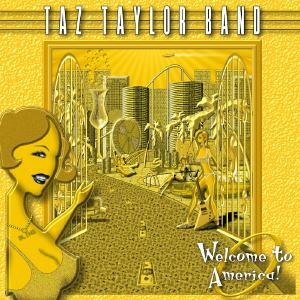 This album will easily be in my Top 10 of 2006 and I will be watching for more Taz Taylor in the future. Taz Taylor also has one previous album to check out, CAFFEINE RACER (2004), which is a 12 song instrumental album. Ebay Madness – Bid on John Corabi’s hair! Wow! So this is what happens when you need some money. If you are the high bidder you can own John Corabi’s (The Scream, Motley Crue, Union, Ratt) hair. There are two sets of John’s dreads on Ebay: one from his Union days and from his current gig in Ratt. The opening for both auctions is $75 for a major piece of Rock history!